Drama, France, 1969, 105 min. Synopsis The narrator (Jean-Louis), a devout Catholic, moves to a provincial town and vows to marry Francoise, a pretty blond he notices at mass. 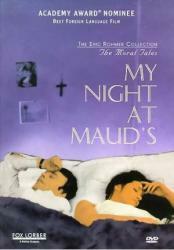 Vidal, an old school friend, invites him to visit the recently divorced Maud, and the narrator ends up staying the night, having philosophical discussions in her bedroom. Next morning the narrator engineers a meeting with Francoise.